With panoramic views across Cambridge and The University Colleges enjoy a glass of prosecco, a classic cocktail, or a cooling glass of Pimms from our extensive drinks menu. A dazzling success since opening in 2010 the iconic roof terrace boasts a unique setting. 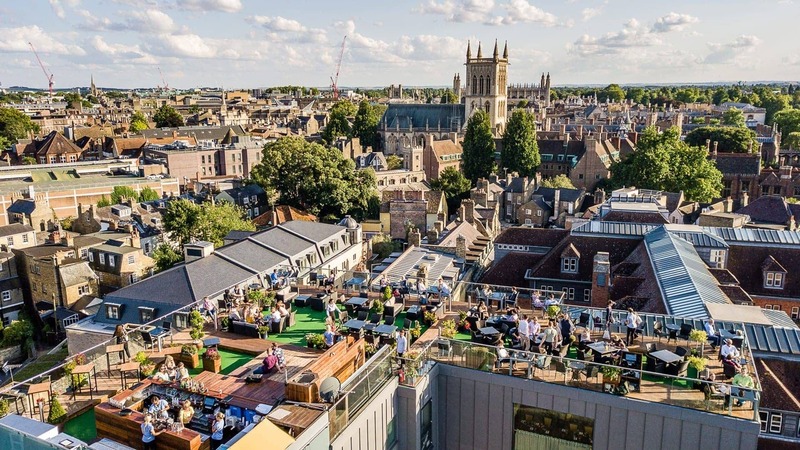 The stylish rooftop terrace is, of course, a famous Cambridge landmark, but the tempting knock-out cocktails, lychee or passion fruit martini’s, blushing Russians, summer G and T’s and many others also command a well-justified attention. During weekends we offer a BBQ menu. The Roof Terrace is available for Private and Semi-Private Hire. The roof is now open from 12pm - 10pm every day, weather permitting. *Due to the possibility of adverse weather, we do not accept reservations. During busy periods we are unable to accommodate large groups.